Being friends with a horror writer means my life is just a little bit more colorful at times. Remember a couple of weeks ago when I mentioned I had a pleasant visit to an Ashe County funeral home ? 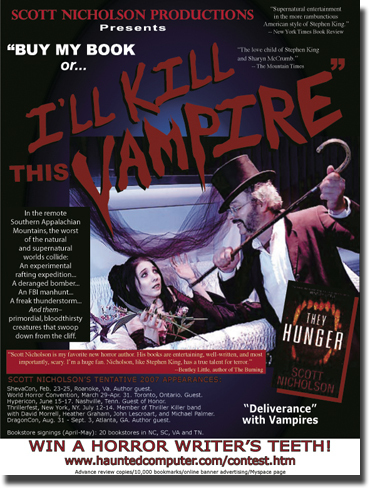 The above poster to promote my friend Scott's new book, The Hunger, is the result of that romp through the graveyard. I like the campy 1950's movie poster style. And in staying true to form, he's offering up a couple of his teeth to a few lucky fans. Only Scott is capable of dreaming this stuff up. Oh and, my mother wants your opinion. I know. I really had to do a double take on her email she sent to me this morning. Normally she gives opinions, and not asks for them. But because this is a matter of poor taste, something she obviously knows nothing about, she quickly went straight to the tackiest source she knows, me and you. I am hosting a Tacky Tea on The 14th for the Tea society which is the opposite of a proper southern tea . Would you please ask your blog buddies for tacky foods I might serve? The food must still taste good but which one would never actually have the audacity to serve at a real tea. The only item I could think to share with her is the ever popular Velveeta Cheese Fudge. I'm sure if you offer up suggestions, I could twist my father's arm to take a couple of photos of the spread.